Sparkling Adventures -✯- Janam din ki badhai! 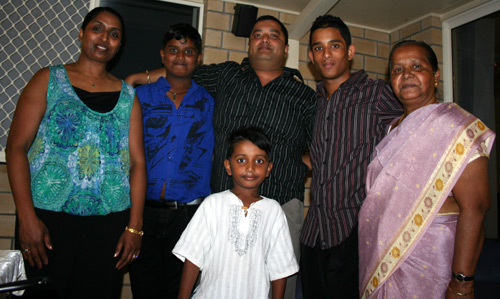 The Dayals: Kavita, Zech, Dinesh, Jere, Aji (Dinesh's mother) and little Aaron (out in front). 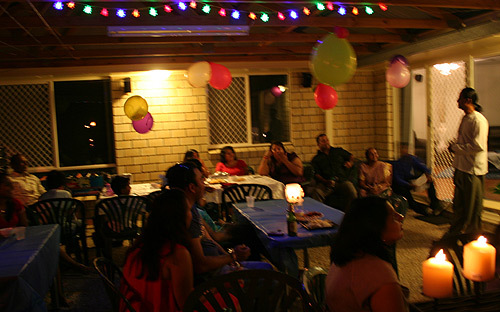 Our Indian friends invited us to their house on Saturday night for celebration of Dinesh’s fortieth birthday. The party was a surprise, as Kavita invited everyone and planned it all on the sly. Kavita even went so far to contact Dinesh’s work supervisor to ensure he wasn’t given any work shifts over the weekend, which made Dinesh think his supervisor was out to get him! There was a crowd of about thirty people celebrating Dinesh's fortieth birthday. Relatives drove up from Sydney (about 12 hours away), and a good friend flew in from Fiji. Dinesh didn’t suspect a thing until he noticed the hired spit in the backyard, and then all of a sudden things started falling into place. The Indian community really knows how to celebrate well. Most of these Indians have come from Fiji, so Fijian customs are mixed with the Hindi traditions. Guests are greeted with a little cup of kava served by the host (in this case, Dinesh’s older brother because Dinesh was the guest of honour). If you’ve seen Monsoon Wedding or Bride and Prejudice (both highly recommended films! ), you’ll have some idea of the way the Indians celebrate with song and food. However, Fijian Indians are more relaxed in their customs, and their gatherings are not segregated by gender as formal Indian traditions require. A large amount of meat is cooked in a closed spit, similar to the buried lovo/hangi of Fijian or Maori cuisine. Women spend all day in the kitchen, preparing a range of dishes, and the dessert is always accompanied by a platter of fruit and traditional Indian sweets. 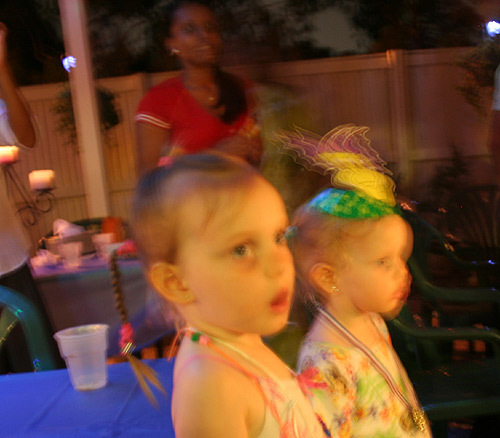 Our girls were mesmerised by the colours, lights, noise and people. The whole family is included in the celebrations. We were the only Anglos there, but other families brought their young children. The house was open to whoever needed to put their kids down for a sleep, and the drinking was kept moderate. When we left at 11 pm, our kids had already had a sleep in one of the bedrooms, and the night was still young to the remaining guests. 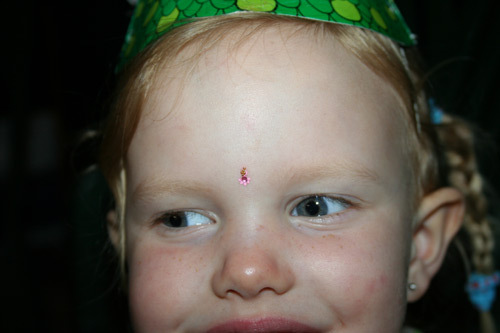 After we admired the jewels on one of the ladies, she gave Brioni a tikka bindi to wear on her forehead. I was so pleased that the girls got to experience a different culture’s tradition of birthday celebrations. There was a cake, and some presents, but the emphasis was on catching up with friends around home-cooked food, something to aspire to!